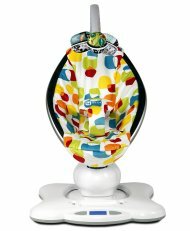 MamaRoo swing is the most technologically advanced baby swing on the marked. It was created not to compete with other swings but to mimic the exact motion parents use to soothe their babies. 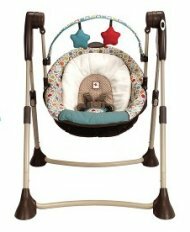 Thanks to its unique design it can replicate the so comforting swinging and bouncing movements of mothers arms. It’s also capable of moving the seat in such a way as during a car ride. For many babies this particular motion is especially relaxing and soothing. I found this to be particularly useful as my daughter just loves to accompany me while I drive, even though she almost instantly falls asleep. MamaRoo also features several other movement patterns that were found to be the most efficient in comforting babies and comes with a vast range of other features. once folded takes litte space. Works on batteries and AC. 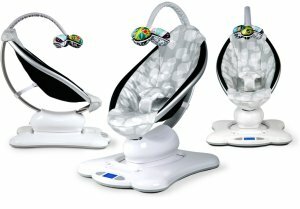 MamaRoo swing is a product of scrupulous scientific studies which were performed by specialists. The professionals hired by 4moms investigated how parents move their arms when soothing their babies. Special sensors were attached in various parts of their arms and cameras were used to monitor the movements. On the basis of this experiments MamaRoo swing was designed to closely mirror what parents do. This way 4moms’ product is not only the most innovative swing you can buy but also it’s the only one offering your baby natural comforting motion of mothers arms. Infinite recline seat. 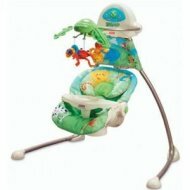 Depending on your child preferences you can easily adjust the recline of the seat to her liking. Usually younger infants and newborns feel most comfortable lying nearly flat once older babies wants to be more upright. The regulated seat was a bliss for my daughter as she has reflux and after her meal she has to have her head slightly higher. High quality plush fabric. Its very soft and nice in touch. Music player. As some babies prefer relaxing music before falling asleep there are 4 built-in sounds to choose from. Additional melodies can be played from four mp3 player, smartphone or tablet via a cable (included) or bluetooth (built-in). 5 different motions. Mamaroo in contrast to other swings, that offer only gliding motions, sports five advanced moving patterns: Car ride, Kangaroo, Tree Swing, Rock-a-Bye, Wave. You can also choose from 5 different speeds. My daughter’s favorite was Car ride and Rock-a-Bye, both on fastest speeds. Thanks to large screen LCD and intuitive panel the swing very easy to use. All you really need to do is to select a motion pattern and a speed. As the overhead mobile pivots I am able to access the seat with ease. There is also no risk or bumping the baby into a mobile or a need to practice special acrobatic figures to place the baby safely inside the seat. After some time (3 days to be exact) I had to wash the seat cover due to a diaper leak. Removing the cover with just two clips and a zipper made the whole operation swift. New parents often have a lot on their minds thus you may forget to buy batteries for your swing. With MamaRoo it’s not a problem as it comes with an AC adapter. 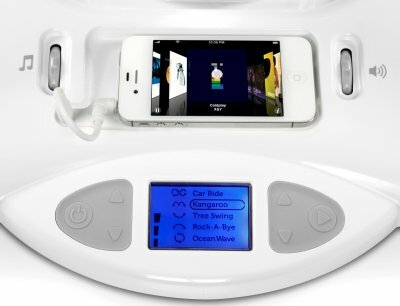 Both motion pattern and sound can be controlled with a smartphone or a tablet. The application is available for iPhones, iPads and Android devices. Your commands are transferred wirelessly via Bluetooth so you can change settings without standing up from your comfortable sofa. Cable (with 3.5 mm jack) to connect MP3 player or other audio device. Controls are on the ground (may be accessed by other babies).